Jeff had come back from his home in Apple Valley to join Karl and I for a few days in the hills southeast of Barstow. 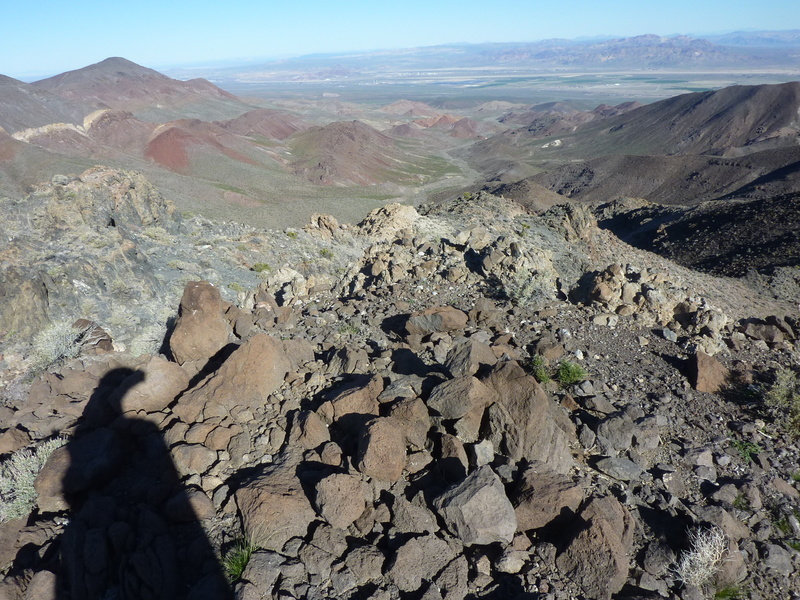 Today's climb was intended to be a three-peak effort around Newberry Peak, which rises prominently to the south above Interstate 40 at Newberry Springs. Karl and I had spent the night camped at the end of Troy Rd, southeast of Newberry Peak, Jeff joining us on time at 7a the next morning. In order to facilitate a point-to-point hike, we left Jeff's truck at the old landfill at the base of Newberry Peak and piled into the jeep for a several mile drive south. I ended up on the wrong road and was more than a mile past the missed junction before realizing the error. Rather than back-tracking, we decided to continue on the road we were on to add a fourth peak to the hike. Jeff argued that we might as well add a fifth peak since it was close to the fourth. We drove the very rough road up Kane Wash for several more miles until we met a gas line road. This road, in excellent condition because they were upgrading the gas line, took us southwest towards Camp Rock Rd. We parked on the gas line road on the south side of the Newberry Mtns, about 3mi from the first peak. Conveniently, there was a porta-pottie left here for the work crew, and several of us took advantage of it before starting out. The hike was very easy at first, following a shallow wash north into the Newberry Mtns. Some of the slopes were quite green with Spring growth, but this gave way to harsher, dry terrain as we climbed higher out of the wash system. Much of the Newberry Mountains is composed of rough, dark volcanic rock, not the easiest terrain to travel through. It took about an hour and a quarter to reach the first summit, located about 1.6mi ENE of the range highpoint. In leaving a register, I gave the name "Birthday Peak" to the unnamed summit because Karl had just celebrated his 64th year two days earlier and Jeff was turning 61 in another 5 days. As a bonus, today was also my daughter's 20th birthday. As Jeff had pointed out, our second peak was fairly close, about 3/4mi to the northeast, unofficially called Newberry Mountain on PB. We had to backtrack a short distance to the south to get on the connecting ridgeline between the two peaks, taking about half an hour to travel from one to the other. We found no register on this summit nor on the next two. Here's where things get a little interesting. Though less than 2mi to the next peak, it would take us well over two hours to travel between the two. While there is a connecting ridgeline, following it is not easy, nor desireable, given the ups and downs along the way. We first headed north to get over Pt. 4,729ft. We startled a flock of bighorn sheep, perhaps a dozen all told, from the saddle between the point and Newberry Mtn. They took off, up and over Pt. 4,729ft, disappearing to the north. It seemed odd that they didn't go off the east side of the point, but when we got there ourselves, we found out way. There is a formidable cliff band on this side that we made an effort to climb down through, only to back off when the way become untenable. We ended up having to follow the route north that the sheep had taken, Karl leading the way around another point before descending through a break in the cliff band. We dropped into the drainage to the northeast, following this for almost a mile before veering right up a side drainage to get us heading towards Peak 4,060ft, our third stop. We had to go over a saddle and down into a second drainage before we could begin to climb the peak. It wasn't until nearly 12:30p that we reached the third summit where we took a break and discussed our options at some length. Though not all that late, we were getting tired by this time. We could have skipped the last two summits and headed back to Jeff's truck, but I wanted us to at least get to the fourth peak, a little over a mile to the north and easier than the one we'd just done. Plus, I knew if we got to the fourth, there was a stronger chance of talking us into the fifth. Getting from Peak 4,060ft to Peak 3,780ft took us north, down steep slopes in that direction into a first drainage, then over a shallow saddle into a second drainage before climbing Peak 3,780ft from the southwest. While I chose to head directly off the north side of Peak 4,060ft at the start of this leg, Karl and Jeff chose what looked to be an easier descent with a small detour to the west. My route worked out better than it had first appeared and I was easily over the low saddle in the middle well before them. It was 1:30p by the time I topped out on the rocky summit, Jeff arriving a few minutes later and Karl a bit after that. When I brought up the last peak on the tour, Newberry Peak, another 1.5mi to the northeast, Karl responded with, "You guys have fun with that!" After a bit of rest and a little coaxing, he eventually came around to our way of thinking and agreed to join us - at least for the intial descent off Peak 3,780ft, after which he would reassess the situation. This was as good as a win in my book, because I figured after joining us off the north and northeast side of the mountain, he'd be within a mile of Newberry Peak and almost certain to join us for the last peak. And so it worked out precisely thus. It was made easier because the route between the two was not as complicated as the previous segments. After descending from Peak 3,780ft, we had a nice, half-mile walk up a shallow drainage heading north, then a straightforward climb to the summit, taking about an hour. There was a profusion of small yellow poppies blooming on the slopes of the drainage we followed, adding color to our route that we'd hardly seen since the beginning of the hike. We also came across an old bulldozer track that made the hiking a little easier heading north along the wash.